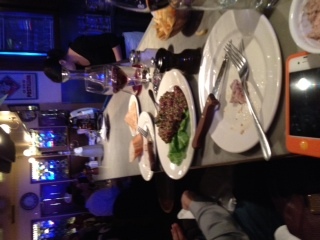 For those who haven’t tried a steak tartare do yourself a favour, seriously! Once you get passed the warm bread and, and, and, the smooooooooooooth milky butter (hard to know when you’ve had enough), you’ll find yourself with a dish made for those who like smiling. Raw melt-in-your-mouth beef with spanish onion, parsley, capers and french-buddha-chef knows what, will make you reach nirvana, reincarnate and become the new happy fellow in your hood. Almost a hundred wines will be waiting at France Soir’s wine list for you, but a glass of curly flat pinot noir will ensure happiness forever after. Does it have to end here? Bread please. Es toda una poesía esa deliciosa comida,que hace soñar e imaginarse y chuparse los dedos.